National radioactive waste repository programmes are collecting large amounts of data to support the long-term management of their national programmes for radioactive waste management. The data and the related records increase in number, type, and quality as programmes proceed through the successive stages of repository development: pre-siting, siting, characterisation, construction, operation and finally closure. Regulatory and societal approvals are included in this sequence. Some programmes are also documenting past repository projects and facing a challenge in allowing both current and future generations to understand actions carried out in the past. Metadata, "data about data", are a key tool of the modern data management. They help the radioactive waste management organisations (RWMOs) better utilise their data in carrying out their statutory tasks and can also help verify and demonstrate that their programmes are appropriately driven. Metadata also allow context to be stored with data and information so that they can be located, used, updated and maintained. They provide provenance to the data (who, what, when, where, why and how), they describe data quality and they support searching for information (e.g. promote scientific research, engineering, safety assessment). The Radioactive Waste Repository Metadata Management (RepMet) project is a four year initiative launched in January 2014 under the Integration Group for the Safety Case (IGSC) of the NEA Radioactive Waste Management Committee (RWMC). The initiative has aimed to bring about a better understanding of the identification, administration and application of metadata to support national programmes in managing their radioactive waste repository data, information and records in a way that is both harmonised internationally and suitable for long-term management and use. Several worldwide RWMOs and research laboratories from NEA countries have been involved in the RepMet project: ANDRA (France), ENRESA (Spain), JAEA (Japan), NAGRA (Switzerland), NDA/RWM (UK), NWMO (Canada), ONDRAF/NIRAS (Belgium), POSIVA (Finland), PURAM (Hungary), DoE Sandia National Laboratories (USA), SKB (Sweden), SURAO (Czech Republic). The RepMet group meets twice yearly; working groups, composed of RepMet members and contractors, carry on the project work in the intervening periods. RepMet has produced five key inter-related documents as shown in the picture below. RepMet/01 – Metadata in Radioactive Waste Management provides an overview of metadata and its application within RWMOs, discusses issues around the implementation of metadata, and outlines the outputs of RepMet and how they may be used. It also provides specific recommendations concerning metadata for RWMOs. The three reports identified as RepMet Libraries are more technically detailed. They discuss the key aspects of data and related metadata for selected scientific and technical topics involved in the lifecycle of a radioactive waste repository as summarised in the table below. The reports include, and are underpinned by, three technical libraries, containing high-level conceptual data models, descriptions of data entities, attributes, associated metadata and other relevant information, and are ready to support the activities of RWMOs. RepMet/02 – Site Characterisation Library deals with data and related metadata that are considered during the characterisation of a site investigated and surveyed for suitability for radioactive waste disposal purposes. RepMet/03 – Waste Package Library deals with data and related metadata about packaged waste and spent nuclear fuel that, after proper treatment and conditioning processes, are ready for final disposal at the repository. 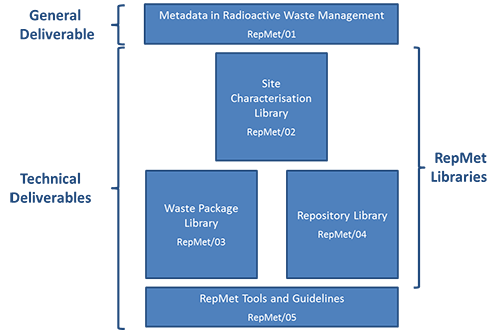 RepMet/04 – Repository Library deals with data and related metadata relating to the engineered structures and waste acceptance requirements of radioactive waste repositories. RepMet/05 – RepMet Tools & Guidelines supports the libraries, providing a number of tools, methods, guidelines and approaches that were either used in developing the libraries or will be useful for RWMOs when adopting and implementing the libraries. Download the vision document for the RepMet project.